i wallpaper i made that goes with 'Shadow - There is Darkness'. the WP layout is off my aegis wallpaper. This is a good one too. But the Shadow is better. Why? Cuase I like Shadow better than Sonic. But still a good wallpaper thou. Very nice. 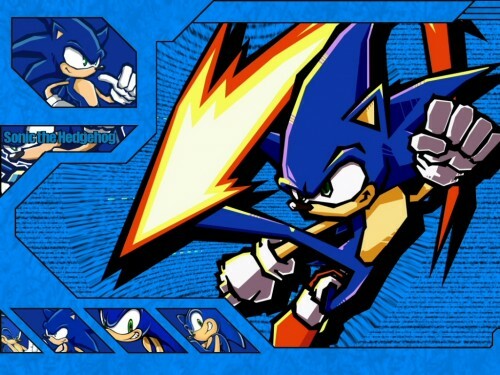 Freakin Sweet wall man!I like the sonic wall, and the image is really good, since good sonic images are hard to find. I also like the sub-pics and the vortex effect in the background. Nice and solid wall Vasaga. Nice job! this wall is so good but wall shadow is great. i like this wall thank you for sharing and submission to me. Dude! Someone else actually likes Sonic. I love this. And it's the Sonic Battle version! Man this is so sweet. I love your wallpaper series. Think you could make one of my character Seth?